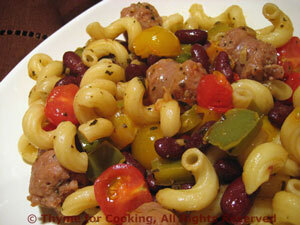 Pasta with Sausage, Peppers and Cherry Tomatoes, Weekly Menu Planner. Cherry tomatoes always appear long before regular tomatoes in the local markets. They're fun to use: they cook down quickly and add fresh flavor after a winter of using canned tomatoes. They also keep well - but, as with other tomatoes, try to avoid refrigeration.